1.4.3 inch color screen, display intuitive. 2.Support USB 2.0 interface, and read and write files on USB. 3.128M memory, which can be run independently from PC.Easy to cut in large quantities. 4.Automatic blowing, auto focus, foot switch, safety protection and other functions. 5.Power cut and continuous carving function. 6.All aluminum parts are processed by CNC machine tools, and the work piece error is 0.1 mm. 7.All aluminum parts are oxidized. 8.Equipped with water temperature display device. 9.Equipped with multi-function receptacle to facilitate the installation of pumps and fans. 10.Use stainless steel hexagonal screws to prevent rust. 11.The bearing package is made of PEEK steel, which is resistant to high temperature. 12.The mirror USES metal lens, the spring adopts stainless steel to prevent rust and lose elasticity. 13.Large exhaust pipe design, front double exhaust fan, which is suitable for large area carving. 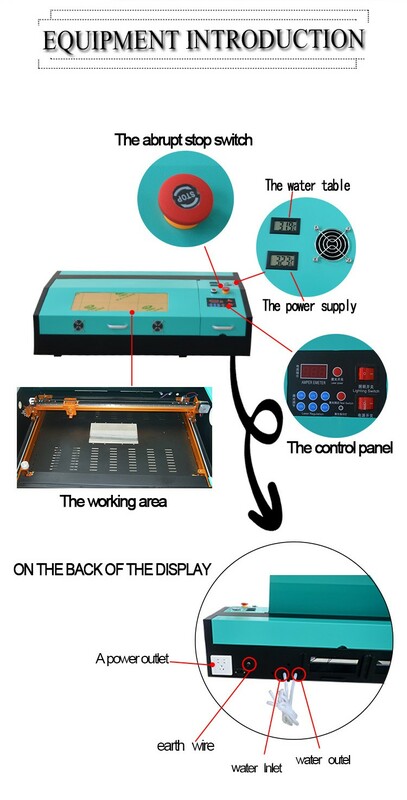 14.Multi-function display screen, adjustable 0.1W power, convenient and quick. 15.The built-in HTK linear guide design enables the whole machine to last up to 10 years. 16.With double coupling, the engraving operation is more stable. 17.The library contains 2,000 files, laser anti-counterfeit fingerprints and thousands of fonts.